A discussion of Matt's experiments in methods of classroom guitar instruction at the middle school level. It also features links to related sites on the use of guitar in music education and guitar pedagogy. This weekend, my 17-yr-old and I made 27 footstools for my guitar classes at school. This simple and economical design is based on an idea I got from Suzanne Shull at the GAMA Teaching Guitar Workshop in Atlanta a couple of weeks ago. The most basic design is 3 8-inch 2x4's screwed together. This makes for a foot stool aproximately 6 inches tall. If you turn it on its end you get a footstool that's approximately 8 inches tall . So you have two heights in one footstool. I also used some extra wood to make about five of the footstools 4 blocks high. This is a little more stable than the 3 blocks turned on end. I also made one footstool that's a 4x4 block with a 2x4 attached. I only made one of these. The 4x4 is what we got at the workshop one day as our footstool. I just screwed a 2x4 to it to make it a little taller. This year I'm going to have my students actually sit in classical position with footstools. I haven't in the past because I didn't have a way to purchase footstools for an entire class. I thought the wood block idea was pretty good and it's inexpensive. So, I'm giving this a try. The total cost for the lumber and a box of screws was just under $25.00. Sweet. It also helps to have a teenager to help put them together. Thanks, Matthew! August 18: Since I posted this, I've had the opportunity to use them in class for about a week. I think the flexibility of the 3-block high version is great. Four blocks is too high for many of the taller kids playing the full-size instruments and also for smaller kids with 3/4 size guitars. I like the both-sizes-in-one flexibility of the 3-block. I don't have to swap footstools out. I have three different classes and I need both height options at each seat. I'm thinking about taking a board off the 4-block version. 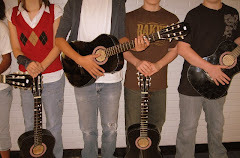 Discover Guitar's awesome video on the growth of school guitar programs in recent years.